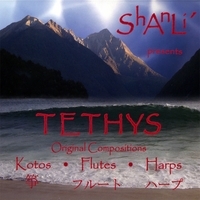 Soothing instrumental harp, flute and koto inspire a meditative musical journey around the world, with Japanese, Celtic and Indian flavors for reflective and creative moments alike. Shiho Kurauchi was born near Kyoto, Japan. She earned a degree from Kunitachi College of Music in Tokyo for Music Education, then studied Koto under Akemi Tatemichi, an instructor from Sawai Koto Institute. Shiho earned an advanced certificate from Sawai Koto Institute, moved to Seattle, Washington and founded a Koto ensemble called Silk Strings. She has performed at the Folklife Festival, Hiroshima Peace Memorial at Green Lake, Seattle, and several Japanese festivals and events in the Seattle area. Shiho has also been invited to the Cornish Music College, Washington State University, public and private schools to demonstrate Koto music. Shiho and her ensemble play modern to contemporary koto music as well as her own originals, passionate improvisations, and often include diverse instruments such as flute, harp, guitar, piano, vocals, African drums and many other percussion instruments. For details on Shiho Kurauchi, Koto, and Silk Stings, please visit: www.silkstrings.info (see link below). Ann Lindquist plays concert, alto, bass and contrabass flutes, celebrating a repertoire that spans across meditative, jazz, classical, folk, Latin, and Middle-Eastern styles, and draws tenderly upon Ann’s love of improvisation. She has played the Washington Performing Arts Center, Oregon Country Fair, Bumbershoot and Folk Life festivals in Seattle, pyramids in Mexico and Ayers Rock in Australia. Ann draws much of her inspiration from nature, and can often be found toting a flute or three along for a peaceful day-hike. She holds a Fellowship from the Institute for Music Centered Therapies and studied 'Sacred Cross-Cultural Healing Music' at the Open Ear Center in Bainbridge, Washington. For details on Ann Lindquist's flute journeys, please visit: www.annlindquist.com (see link below). Linda Khandro has been playing music and dancing her entire life. Originally trained in piano and voice, she played guitar, dulcimer and cello before settling in with the harp, tamboura (India) and dousongoni (west Africa). She has been playing percussion just as long, and teaches harp and rhythm workshops. An avid improviser, she draws on experiences with the Creative Music Studio (New York) to substantiate her harp music at the bedside of people ill, dying, or birthing. Linda was one of the first performers in the Samsara Meditation Ensemble, founded in 1999 in Seattle, Washington. Her two CDs Transition and Full Hearts, Empty Mind are popular recordings in use by a variety of therapists in their clinical practices. For details on Linda Khandro's work as a geologist, musician, and teacher, please visit: www.lindakhandro.com (see link below).